Self-employed Adrian has been a roofer since 1988 and had built up a very successful business. It was a normal day when Adrian set out for work as a roofer on 11th March 2017. On the way home from work he decided to fit one more job in. He knows he was rushing and he knows that when he put the ladder up against the building he should of used the tie offs. But he’d been climbing up and down ladders for nearly twenty years, so thought he was OK. He wasn’t. The ladder slipped when he was near the top and Adrian fell 20 feet, landing on his neck. That day is now permanently ingrained in Adrian’s mind and he relives the actions that he should have taken to make himself safe. Adrian is still coming to terms with being tetraplegic. He has very limited movement in his arms, no movement of his hands and is paralysed from the chest down. He spent the best part of a year in respite care as his home was not suitable for him to return too, but Adrian, and Jemma his partner, wanted him home where he would feel more comfortable and be with his family. After a long battle with the local authorites Jemma managed to get the family home adapted with funding from a Council grant. But the grant did not cover the equipment that they wanted, namely a specialist bed that Adrian and Jemma could share, rather than Adrian having to use a hospital style bed and another separate bed for Jemma. Whilst Adrian was in respite care waiting for the adaptations to be completed, a chance conversation with a support worker about the need for a specialist bed prompted them to explore other areas of help and that’s when the Lighthouse Construction Industry Charity came to light. Adrian was given our 24/7 helpline number and made an application for financial assistance. Adrian said, “At the time of applying for help I had never heard of the charity and never believed that I would be successful in getting anything. I thought that because I was to blame for the accident, that no one was going to help me”. When we received Adrian’s application we arranged for a Wellbeing Volunteer to visit. Jemma had already arranged for a company to visit but they were unable to offer a specialist bed that Adrian and Jemma could share. Our Wellbeing Volunteer then contacted several other organisations to source something suitable and provided a comprehensive report. 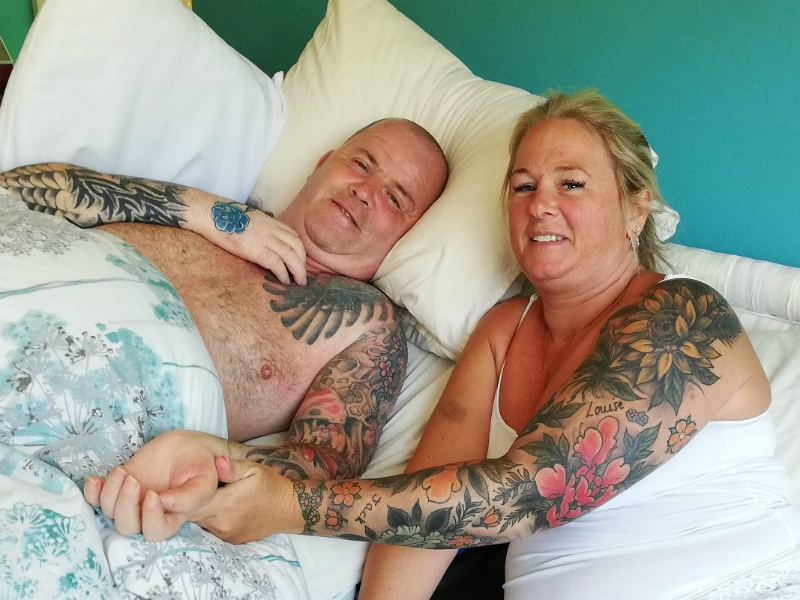 The committee approved the full cost of the bed to enable Adrian to return home and spend quality time with Jemma and the family. Adrian and Jemma added, “With the support from The Lighthouse Club Charity we now have some normality back in our lives. I know what I did was stupid, I am living with that every day of my life, but I am alive, I have my family and thanks to you I can be with them, Thank you”. If you’d like to know more about how you can support our work and help people like Adrian, visit our Support Us page.